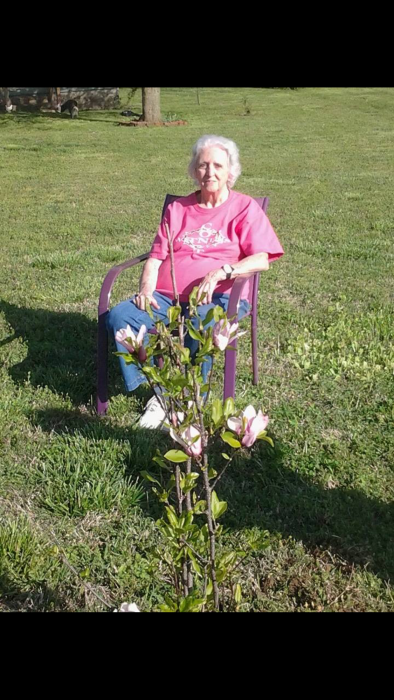 Mrs. Doris Pauline Devasier Cooper, 85 of Covington, passed away on the afternoon of Sunday, April 14, at home surrounded by her family. Mrs. Cooper, the widow of Mr. Corble Cooper, was a member of the Cornerstone Assembly of God Church. Mrs. Cooper is survived by her daughters, Evelyn (Darrell) Berry of Delaware, AR and Wanda Garrison of Covington; her sons, Norman (Sandra) Cooper and Edward (Ruby) Cooper both of Covington; her special daughter, Kim Freeland and her dog of 18 years, Buttons; her twelve grandchildren, twenty great-grandchildren, and fourteen great-great-grandchildren. Mrs. Cooper was preceded in death by her parents, Louis and Leathie Allen Devasier; her brothers, Connie Leroy and Floyd Devasier; and by her granddaughter, Amanda Berry. Services for Mrs. Cooper will be held on Wednesday, April 17, at 11 AM at the Maley-Yarbrough Chapel. Visitation will take place Tuesday evening from 5-8. Interment will follow in Covington Memorial Gardens with Rev. Johnny Byrd and Robert Chumley officiating.